Abundant rainfall, balmy temperatures, and huge swathes of pristine land make Belize one of the most biodiverse countries on the planet. More than 4,000 different native flowering plants can be found in Belize as well as more than 700 different species of trees and other flora. Scientists have only just begun to catalog all of the different plants in the country, a difficult task as more than 70% of Belize is forest, rainforest, or jungle, much of it old growth and incredibly dense. Belize is home to an astonishing variety of tree species, including historically important ones like mahogany and logwood (originally used to make dye). Indeed, the modern history of Belize began when the first European settlers visited the country to fell valuable species for export back to the Old World. Today, Belize’s national tree is the mahogany (swietenia macrophila), featured alongside a logger on the official flag. Belize’s rich soil is ideal for growing a number of fruit and nut trees. Some of the most commercially viable species include: custard apple (quince), guava, mango, papaya, bananas, pineapple, cashew, coconut palm, and manmee.. 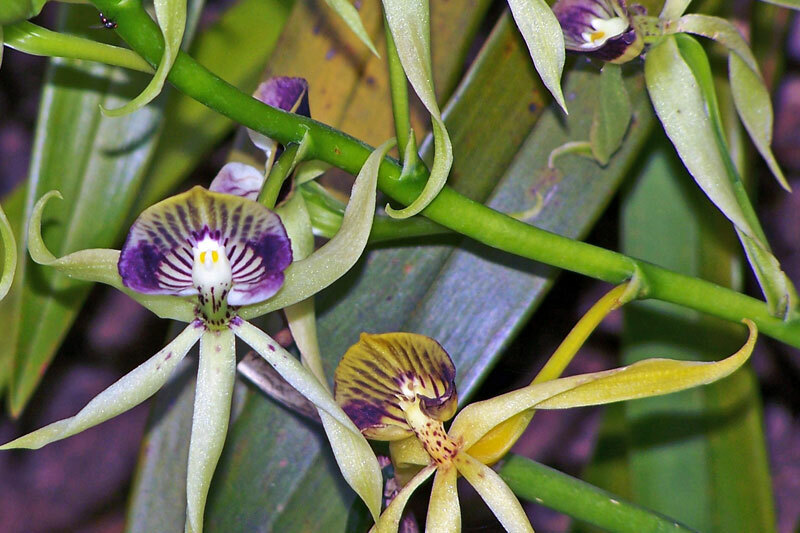 Thanks to aggressive conservation methods, Belize is home to more than 250 species of indigenous orchids. The black orchid (Encyclia Cochleatum) is the National Flower of Belize. This orchid grows on trees in damp areas, and flowers nearly all year round. Its clustered bulblike stems vary in size up to six inches long and carry two or three leaves. Understanding and using native plant species to form effective medicines is a tradition in Belize dating back to the early days of the Maya civilization. In modern Belize, the Panti Medicinal Trail at Ix Chel Farm in Cayo District is a living pathway winding between both arboreal (tree) and herbal plants still used to concoct medicines. Ethnotanists have discovered hundreds of interesting plant specimens in Belize, and many of the world’s leading pharmaceutical companies are studying local plants to create new and ever more effective medicines. Although a complete catalog has not yet been assembled, scientists estimate that Belize is home to more than 4,000 species of indigenous flowering plants divided into 331 genera and 87 plant families. Belize is home to no fewer than five indigenous big cat species including the puma, ocelot, margay, and jaguarundi. The largest and most famous is the jaguar. 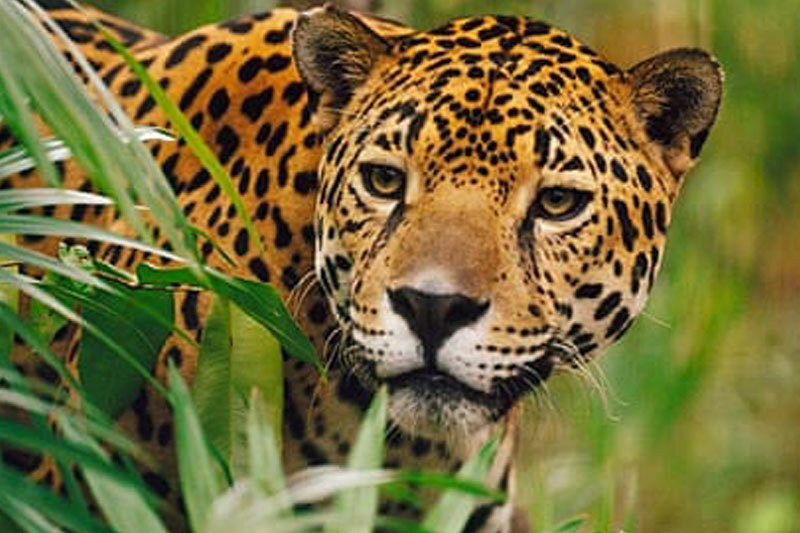 A sacred animal revered by the ancient Maya, the jaguar continues to play an important role for modern-day Belizeans. Biologist Alan Rabinowitz helped create the Cockscomb Basin Wildlife Sanctuary in the 1980s, the world’s only continuously monitored and studied jaguar preserve. 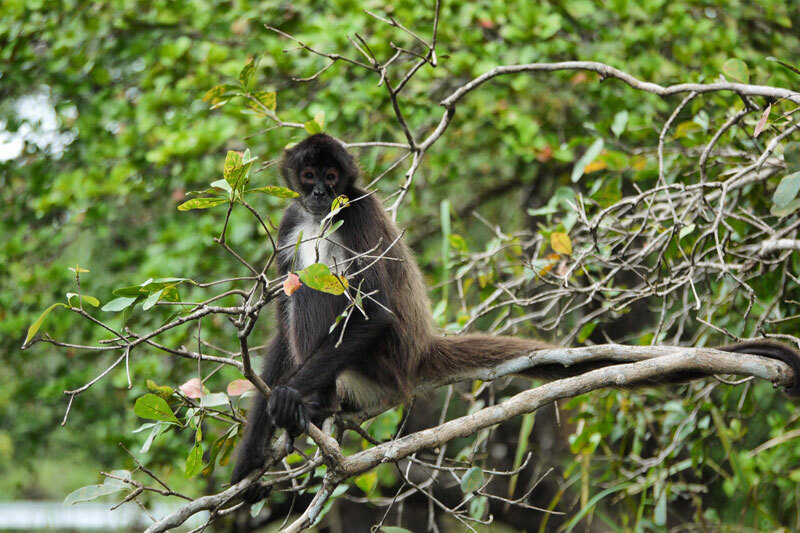 Belize is home to two species of primate – the Yucatan black howler monkey (Alouatta pigra) and Geoffroy’s spider monkey (Ateles geoffroyi).The spider monkey is known for its long linky limbs, and can be found all over the jungles of Belize. Perhaps the most iconic is the black howler monkey, known locally as a baboon, the largest monkey in Belize and one of the largest in the Americas. The Baboon Sanctuary was formed in 1985 to help promote and protect this unique species, officially rated as one of the top 10 loudest animals in the world. Looking like a cross between an anteater and a large rat, Baird’s tapir is locally known as the “mountain cow.” The national animal of Belize, Baird’s tapirs are nocturnal creatures. 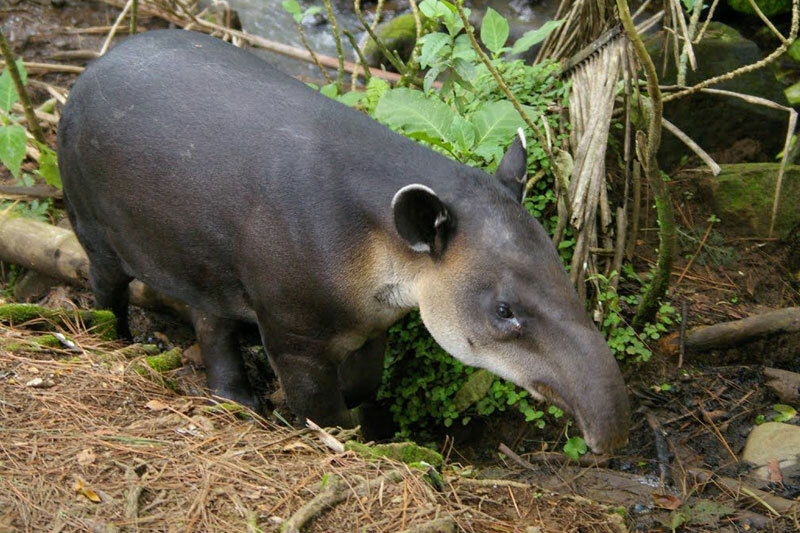 Officially an endangered species, Baird’s tapir thrives in Belize while other populations in Mexico and Central America have largely disappeared. Often called a “sea cow” due to its placid nature, manatees flourish in the warm waters of Belize. Today, Belize has more manatees than in any other country in Central America. No fewer than three of the eight species of sea turtle in the world live and nest in Belize. The green turtle, loggerhead turtle, and hawksbill turtle are all endangered species, their nesting sites carefully protected by conservationists in Belize. Belize has a thriving reptile population, including the yellow-jaw tommygoff, tres minutos, and barba amarilla. Perhaps the most feared snake found in Belize is the fer-de-lance, a nocturnal pit viper that can kill a grown adult in minutes. Several species of lizards live in Belize, including the famous green iguana. Known locally as the “bamboo chicken”, the green iguana is a key ingredient in some traditional dishes. The black iguana, locally known as the “wish willy” and the basilisk, known locally as the “Jesus Christ lizard”, can also be found throughout Belize. Two different species of crocodiles exist in Belize: the American and Morelet’s crocodile. 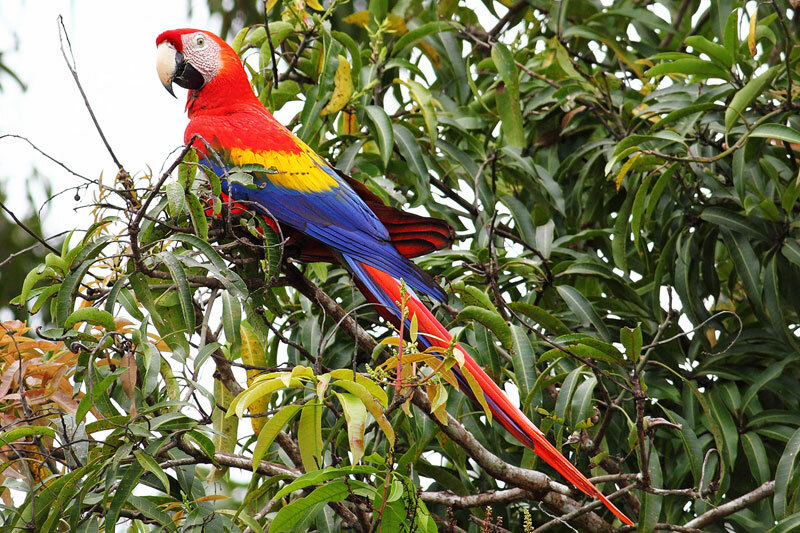 Avian experts have documented more than 300 species of indigenous birds as well as more than 200 species of migratory birds that winter in Belize.The most impressive birds found in Belize are Scarlet Macaw (Ara macao), Keel-Billed Toucan (Ramphastos sulfuratus), Blue-Crowned Motmot (Motmotus motmota), Harpy Eagle (Harpia harpyja), and the Red-footed booby (Sula sula). The Keel-billed Toucan is a colorful Latin American member of the toucan family and is also the national bird of Belize. Known as the “bill bird” locally, the bill of this bird is vivid and is composed of the following colors: yellow, orange, red, green and black. The whale shark is the largest fish in the world, and one of the largest creature of any kind alive today. This species, despite its enormous size, does not pose any significant danger to humans. They are actually quite gentle and can be playful with divers. In Belize, during the spring time, Whale shark frequently visit a unique area on the reef called the Gladden Split, the area, about 30 miles east of Placencia.